We are very happy to announce availability of another high end technology for high end motion capture and film recording: 6 degrees of freedom computer controlled motion platform. 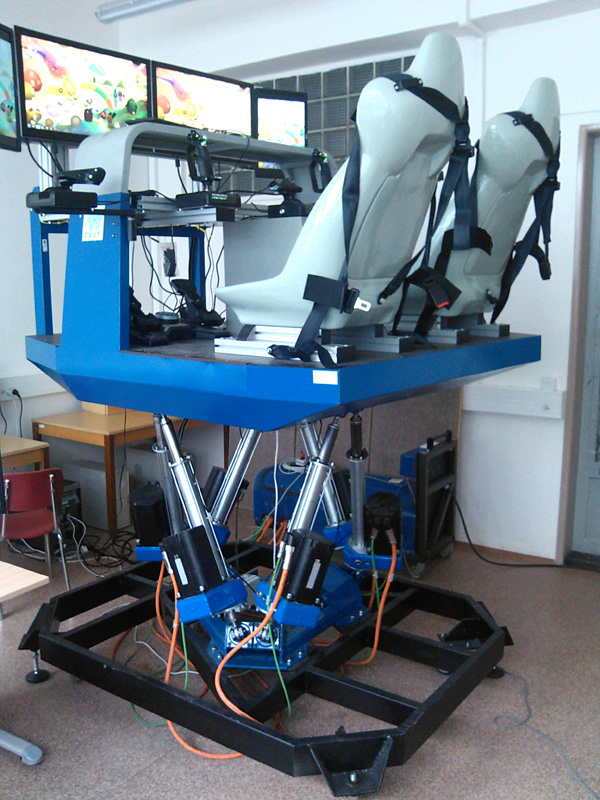 This photo shows the platform with custom built extension for flight simulation purposes. This computer controlled platform enables us to satisfy some high end exotic needs of clients. the platform shall not be used as a camera crane base, on the other hand. 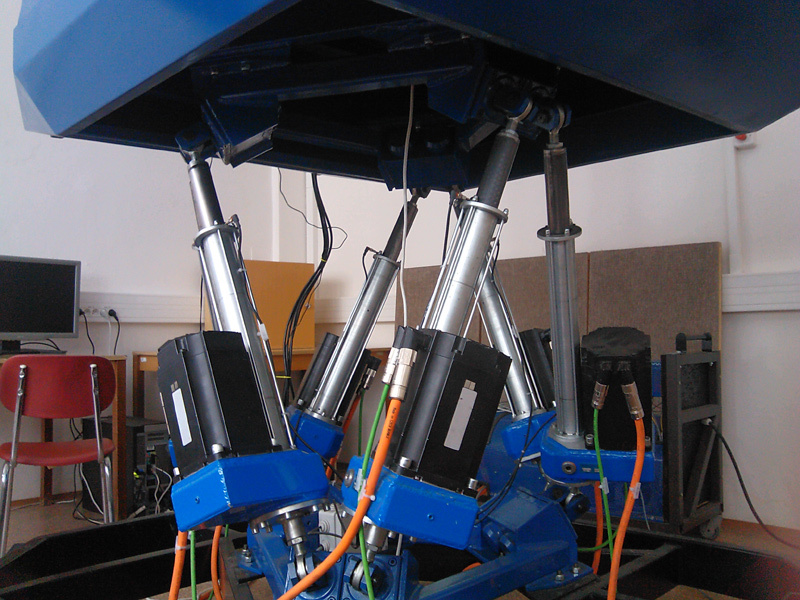 For that, linear carriage is usually needed and additional vibration reduction is necessary. It is developed as a base for creation of a moving floor for people. 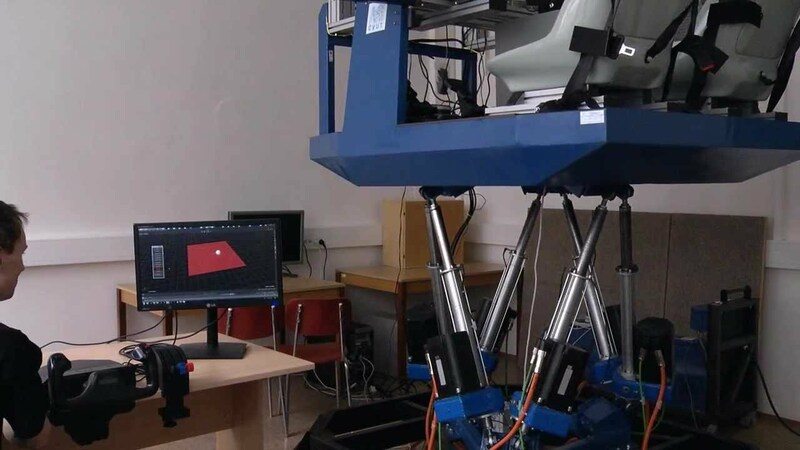 The platform is VERY powerful device able to handle very heavy load with ease, can achieve dramatic acceleration – that must be even carefully filtered because it'd be dangerous for cast. The platform is owned and rented by our valued partner; we developed special communication layer that enables us to control the platform from within Autodesk MotionBuilder(r) software using well known advanced user interface. Clients may even create their own movies in advance and take FBX files with them. Please understand that this system is not readily available for recording: custom tweaking is always necessary and this costs and takes a while to finish. Therefore the device shall be only considered for high end projects demanding extreme motion, precise repeatability or ability to reproduce data recorded by portable accelerometers. The matter of fact is many AAA movies use such platforms for their special effects, let's mention Flight movie. it is necessary to build custom extension on top of the platform, another "floor" with possible chairs etc. We can provide blueprint of mounting holes for screws; the building must be provided by the client or agreed in advance. the platform is located in Prague or near Prague and is transported usually on a truck used to tow cars away. the platform is noisy, therefore it is impossible to record on set audio during its operation. the platform has wheels for easy shift on even floor, however it is approx 500kg heavy! when the weight is not located above the platform, but rather off-axis, the platform may need custom metallic solid support to avoid overturn.